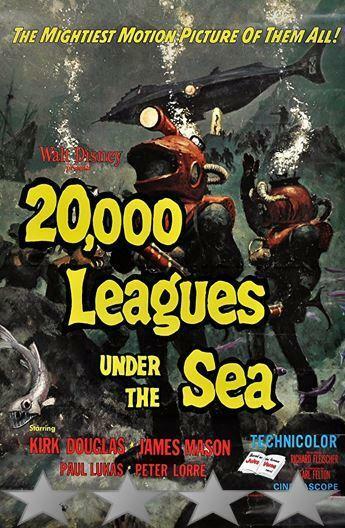 Tagline – Walt Disney’s Mighty, Magnificent, Memorable 20,000 Leagues Under the Sea! Story: 20,000 Leagues Under the Sea starts when scientist professor Pierre Aronnax (Lukas) gets assigned to investigate a large number of sinkings in the open ocean, joined by his trusted sidekick Conseil (Lorre). When the ship they are traveling on gets sunk by the creature, Peirre, Conseil and sailor Ned Land (Douglas) go in search of rescue finding the Nautilus seemingly abandoned on the ocean. The Nautilus captained by Nemo (Mason) tests the men before letting them stay aboard learning the wonders from beneath the ocean and taking on the creatures that have been lurking in the deep. Characters – Captain Nemo is the mysterious captain of the Nautilus, he doesn’t follow any over the rules of the ocean as he plans his own way to clean it up with his loyal men, he reluctantly lets the three survivors onboard knowing Professor Aronnax could help his work. He does get frustratingly tired of Ned’s behavior which puts his crew in danger at times. Ned Land is a sailor that is one of the few survivors from the shipwreck, he doesn’t like Nemo and wants to focus on collecting treasure over learning from the ocean. Professor Pierre Aronnax is one of the most famous scientist in the world, he is welcomed on board the ship because of his reputation which impress Nemo, he jumps at the chance to make huge waves in science onboard the ship. Conseil is the assistant to the professor who quickly starts to side with ned when it comes to the methods being shown onboard the vessel. Performances – This is a strange way to bill the cast, because James Mason is the main character and he is great to watch when it comes to his speeches and ideas for what his character wants. Kirk Douglas is mostly the comic relief which is fun to see for the most part. Paul Lukas fits the posh scientist role in the film which is the one that can simplify things for the audience. Peter Lorre makes for a good sidekick figure for whoever his character helps. Story – The story here follows the character of Captain Nemo that must educate three new crew members of the wonders of the ocean, showing them the answers are here instead of in how the world is acting. This is one that shows us science need exploring rather than questioning which takes out characters across the world to see things never imagined for the 1800s. While the story does give us entertainment, it would have been nice to see them ship take on a real creature for more than five minutes instead of going into the science versus sailing talk we most explore. Adventure/Fantasy/Sci-Fi – The adventure side of this film takes our crew around the world to places they would have never seen to see places only few would have, make new discoveries. The fantasy mixes into the sci-fi because of the films setting in the 1800s where the technology isn’t like anything imaginable. Settings – The film keep sus out at sea for most of the film, it is the interior of the Nautilus which is fantastic creation here show us just what was in the minds of the people. Special Effects – The effects for the time were great, they show us what could have been achieved with practical effects and clever camera work. Scene of the Movie – Squid battle. That Moment That Annoyed Me – Not much creature action. Final Thoughts – This is a must watch classic of cinema, it reaches levels you might not have expected for the time only to become something you need to admire.